Mahali Urugai or Indian sarasaparilla is a root pickle. Mahali is known for its smell and blood purification properties. The strong aroma of mahali is either liked very much or totally disliked by people. There is no intermediate like or dislike of the aroma . I simply love smell and like the taste of the pickle. This is one pickle which I make every time once in a year when I visit Chennai as I have not come across this root being sold in Little India - Singapore. This is a zero oil pickle and apart from blood purification benefits it is used for treating skin and kidney diseases. I generally make hair pack powder with lot of herbs and I use the mahali skin in that. 1. Soak the Mahali in water as it would have mud in it. Wash it nicely. 2. Remove any black parts by chopping. We need to ideally identify while picking up but at times we can make out only while cutting. 3. Peel the skin. The skin can be dried and used in hair pack powder. 4. Cut the Mahali in the middle and remove the thick stem like part which is found in the middle. It is very hard and cannot be consumed. 5. Chop the mahali into small cubes. 6. Add turmeric powder chili powder and salt and mix well. Leave it for 2 days in a closed place. 7. Very rarely water forms. In my case it did not form. We can start preparing pickle after 2 days. 8. 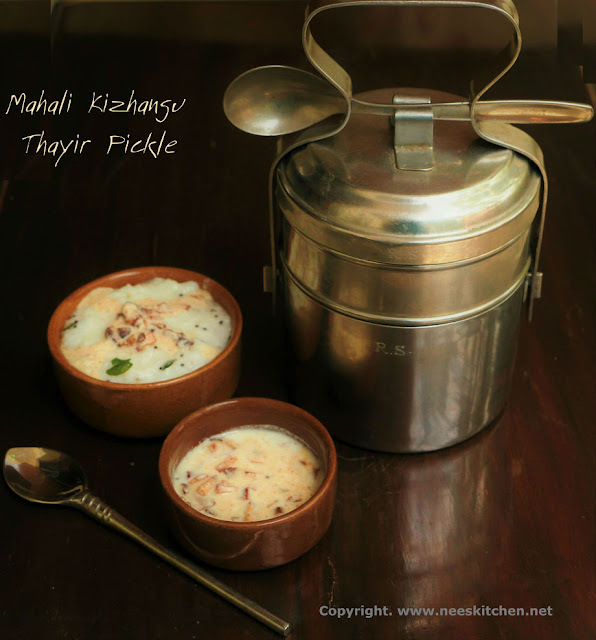 For consuming take 2 spoons from the cut mahali and add 3 tsp of yogurt. Make this mix as and when needed. If it is not consumed within 3 or 4 days the yogurt might become sour. Hence it is good to make this mix once in 2 days. 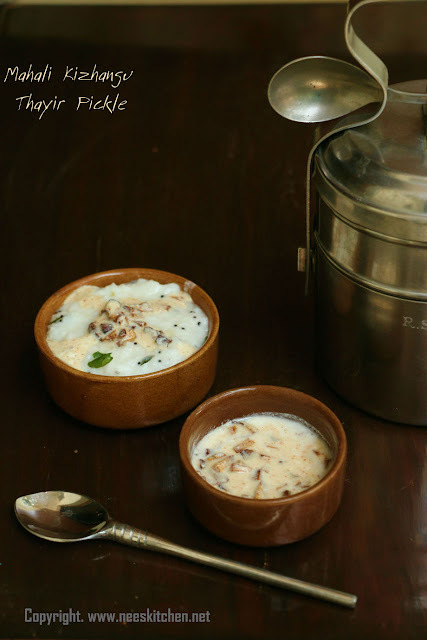 Mahali Urugai is ready to be served with curd rice. There will be a lot of wastage while cutting the Mahali like the black portion, in between hard stem and skin. Hence the final weight varies based on the wastage made. As mentioned earlier prepare the yogurt mix as and when needed else yogurt sourness would alter the taste. I personally don’t like that way. You may add mustard powder.